Home » Reviews » The Morocco Workshop 1994: Not For the Faint at Heart! Monday we learned the choreography to “Layali Assuit”, or “Nights in Assuit” and ended the day with some Saudi. Tuesday we started a cane routine — Rocky’s own routine, and the first time she has taught it to anyone — quite an honor for us! We spent the afternoon working zill patterns, breaking away from the “Chinese water torture” of 123,123,123. etc. Wednesday we went further into the cane, then the afternoon was Tunisian and Schikkhat technique. What a workout! Thursday we finished the cane and covered Guedra, the trance ritual of the Blue People. It is intended to share positive, loving energy with all of those around. 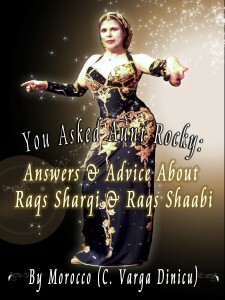 There is a complete article on the Guedra by Rocky in the latest issue of Habibi magazine. Friday we repeated the Cane and Layali, then closed with some Ghawazee, taught by her student Djinii Hassanein. Saturday we ran through each routine one last time, then had question and answer time, asking anything that occurred to us after classes throughout the week. Morocco’s teaching style is easily the best I’ve seen anywhere!!! She shows the full routine, then goes over the first measure, we repeat it four times. Then she shows the second measure, we repeat the first measure with the second added (four times) and so on, constantly repeating as we go so it really set with us. And even if you’re not into learning choreography, you can still pick up new patterns and transitions along the way. The week was a great workout, topped with a show at Cedar’s of Lebanon, with 24 of the 30 participants performing their styles from everywhere — England, Germany, and New York primarily. 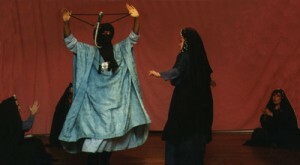 Chandra performed a Spanish fan dance, the only non-Middle Eastern dance. 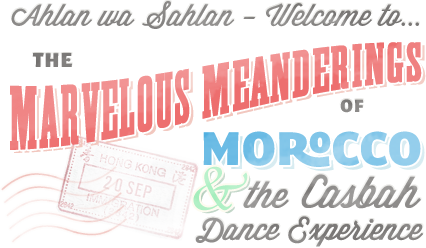 There was everything from Egyptian cabaret to a lovely interpretive number set to a more European piece. Tarik brought us all to our feet when he performed his fabulous routine, topped only by Rocky herself. It was a great week, full of new information and new understandings of “old” information — I really enjoyed it, and will recommend to anyone to go– see Morocco any chance you can get. I understand she will be in Seattle October 30th with Tarik to teach a workshop, and will also be in California for Rakassah next March — GO SEE HER!!! She is a very knowledgeable person, and is happy to share her information with anyone who wants it. 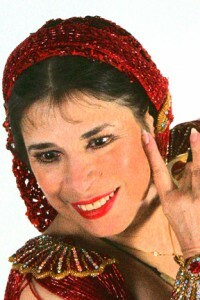 Morocco will be teaching in Seattle next month in a workshop put on by Kashmira. It’s for the po folk who can’t get to San Francisco. See elsewhere in this issue for more particulars.